April 2019: Since 1999, Poland has been divided into provinces, counties and districts. The 19 provinces (voivodeships) represent the highest-level of local government. They are mostly named after historical or geographical regions. Provincial powers are shared between a governor, a regional parliament and a marshal. The governor (volvode) is appointed by the Prime Minister and acts as the regional representative of the central government. The assembly (sejmic), which is elected every four years, legislates in areas such as development and budget and elects the marshall (marszaek) and other members of the executive office. The provincial executive office (zarzad województwa) under the marchal manages provincial property, implements regional policy and supervises the management of European Union (EU) funding. The populations of the provinces vary from 4.6 million (Silesian) to Opole with just over one million people. Provinces are sub-divided into counties (powiaty), which can be rural or urban. Both types have elected councils. The number of counties per province varies from 12 (Opole province) to 42 (Masovian province). 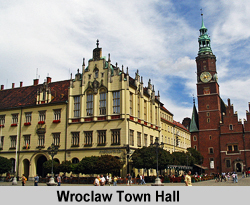 Poland has currently 379 counties, of which 314 are rural and 65 urban counties. Counties have some decision-making powers in areas such as local healthcare, secondary education, public transport, high-road maintenance and vehicle registration. Rural districts and urban municipalities are Poland’s third level of local government. Counties are usually divided into several types of districts (gminy): urban, mixed urban-rural and entirely rural. In all three types of districts, voters directly elect local councillors and mayors. Mayors in cities with more than 400,000 people are called city presidents. Rural and urban districts are tasked with the management of utilities, public open spaces, sewage and waste disposal, health care, housing and education as well as social services and culture. Born 1979, lawyer, politician, studied University of Gdansk (Faculty of Law  graduated 2006), 2004 to 2005 studied at the Faculty of Law of University of Salzburg. In 2006 she was assistant of the Mayor of Gdansk Pawel Adamowicz. 2010 and 2014 was elected as a city councillor in Gdansk. 2017-2019 deputy mayor of Gdansk responsible for the economic policy. 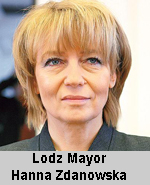 After the killing of Pavel Adamowicz she was appointed interim mayor until the election in March 2019. Since 11/03/2019 Mayor of Gdansk. Studied at theTechnical University of Lodz (Faculty of Civil Engineering and Architecture). 2006 councilor, 2007 vice-president of Lodz, 2007 Member of the Polish Parliament. The Mayor was shortlisted for the 2018 World Mayor Prize. 1972  2001 worked in various city businesses. All his live connected with Rzeszow. Studied at the University of Szczecin (Faculty of Law and Administration). Since 1998 he has been working for the local government In Szczecin. 2002-2004 vice-president of Szczecin. Next election 2022 Born 1972, married (two children), studied in College of Europa in Natiolin and Institute of International Relations of the University of Warsaw, 1996 scholarship at the Oxford University, 2002 European Union Institute of Security Research in Paris, 2004 doctoral degree in political science at the Faculty of Journalism of the University of Warsaw. 2009 Member of the European Parliament, member of European People’s Party, 2013 Minister of Administration and Digitalization, 2014 Deputy Minister Foreign Affairs of the Republic of Poland, 2015 Member of Polish Parliament, 2016 became National Council Member of the Civil Platform Party, Minister of the Foreign Affairs in the shadow cabinet created by Civil Platform, 2017 vice chairman of the European People's Party. 2017 received the order Medal of Honour for his contributions to strengthening the Polish-French relations. Next election 2022 Born 1978 in Wroclaw, social activist and local government member, graduate in sociology at the Faculty of Social Sciences of the University of Wroclaw and a doctoral student of the Collegium of Socio-Economic Policy of the Warsaw School of Economics. 2007 -2011 the director Municipal Social Welfare Centre in Wroclaw. From 2011 the director of the Social Affairs Department of the Wroclaw City Office. April 2019: While the mayors (presidents) of Poland’s largest and third-largest cities are women, overall, only 11 of the country’s 107 municipalities have female leaders. Two of them are in their fourth term of office. 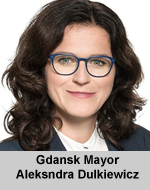 Gdansk Mayor Aleksndra Dulkiewicz was elected in March 2019, after the murder of her predecessor Pawel Adamowics. Only one mayor is a member of Poland’s ruling, right-wing Law and Justice party (PiS), three mayors belong to the centrist, pro-European Civic Platform (PO), while one is supported by the Democratic Left Alliance, a social-democratic, pro-European party. Research by City Mayors reveals that of the world’s 300 largest cities only 25 are governed by women and, in 2016, the local government NGO, United Cities and Local Governments (UCLG) estimated that only five per cent of the world’s urban communities have female leaders. The 2018 World Mayor Project was dedicated to women mayors.